The Hawaii United Okinawa Association is proud to represent 50 clubs whose combined members exceed 40,000 members. This marching unit will include banner holders representing each club along with drummers and music. 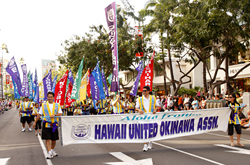 The Hawaii United Okinawa Association is proud to represent 50 clubs whose combined members exceed 40,000 members. This marching unit will be led our President, Vince Watabu, and will include banner holders representing each club along with drummers and music. 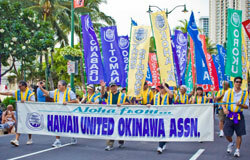 The Hawaii United Okinawa Association is proud to represent 50 clubs whose combined members exceed 40,000 members. This marching unit will be led by our President, Tom Yamamoto, and will include banner holders representing each club along with drummers and music. The Hawaii United Okinawa Association is proud to represent 49 clubs whose combined members exceed 40,000 members. This marching unit will include banner holders representing each club along with eisa drummers from Chinagu Eisa Hawaii, sanshin players from Ryukyu Koten Afuso Ryu Gensei Kai and the executive board of the HUOA, all led by HUOA President Mark Higa. 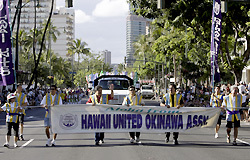 The Hawaii United Okinawa Association is made up of 40 clubs whose combined members exceed 40,000 members. The unit will include banner holders representing the 49 clubs, eisa drummers, sanshin players and the executive board of the organization. Leading the unit will be National Living Treasure of Japan Sensei Choichi Terukina and his wife Mrs. Terukina. 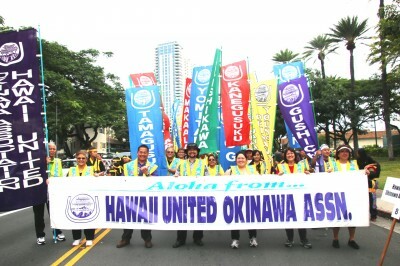 The members of the Hawaii United Okinawa Association, led by President George Bartels, Jr. are here proudly carrying their banners representing the 49 clubs originating from various cities, towns, and villages in their homeland, Okinawa. Creating excitement in the crowd are their “chondara” or better known as Okinawan clowns followed by their paranku and eisa drummers. HUOA is committed to maintaining and promoting a strong bond with the Prefecture of Okinawa, to preserve, promote and perpetuate the culture, arts and history of Okinawa in Hawaii. Led by President, Mr. Ford Chinen, HUOA is committed to maintaining and promoting a strong bond with the Prefecture of Okinawa, to preserve, promote and perpetuate the culture, arts and history of Okinawa in Hawaii. Led by President, Mr. Ford Chinen, HUOA is committed to maintaining and promoting a strong bond with the Prefecture of Okinawa, to preserve, promote and perpetuate the culture, arts and history of Okinawa in Hawaii. 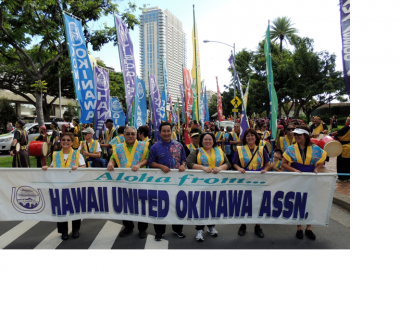 Hawaii United Okinawa Association (HUOA) was established in 1951, as the umbrella organization of 48 member clubs throughout the State of Hawaii. Our colorful parade banners represent the city, town or village in Okinawa from which our issei, or first generation immigrants, traveled from. Our parade participants are dressed in outfits which represent the costume of the small, hand-held drum dance, called paranku. From the first group of 26 immigrants arriving in 1900, those of Okinawan descent in Hawaii number over 40,000 people. HUOA’s Okinawan Festival is the most well known activity. It is a two-day extravaganza held at Kapiolani Park, featuring Okinawan food, arts and other cultural activities. With planning beginning a year in advance, the Festival operates with over 2,000 volunteers. You can find more information about HUOA and the Okinawan Festival at www.huoa.org. HUOA thanks the Honolulu Festival Committee for their invitation to today’s festivities. Our group is based out of the Hawaii Okinawa Center in Waipahu. Our goal is to serve our community.